In this “moving story of how sacrifices accumulate in the wake of passions left unfulfilled” (Publishers Weekly)—perfect for fans of Fredrik Backman and Lisa Genova—a poet must decide if he should put his family’s or his own needs first when he returns to Italy help run the family business he left behind years ago. As the heir to a proud Northern Italian ice-cream dynasty, Giovanni Talamini’s family is none too happy when he decides to break with tradition and travel the world as a poet. So when Giovanni receives an unexpected call from his brother, he is faced with a difficult decision: return home to serve in his family’s interests or continue on his own path in life once and for all? 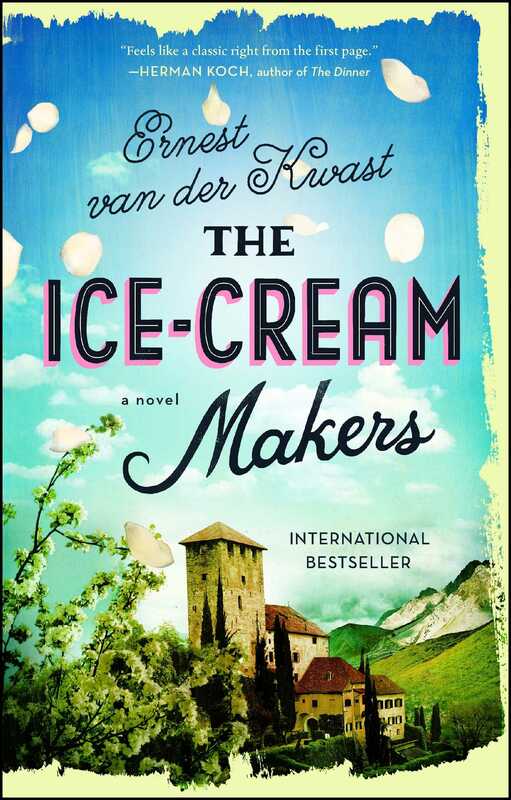 In a heartwarming tale that weaves history with lore and poetry with delicious recipes, The Ice-Cream Makers paints a century-long, multigenerational portrait of a family wrestling with their identity and how to ensure their legacy. This is a “delightful read; smooth as ice cream on a hot summer day” (Kirkus Reviews). SHORTLY BEFORE his eightieth birthday, my father fell in love. It was love at first sight; love like a bolt from the blue, like lightning striking a tree. My mother phones to tell me. “Beppi has lost his mind,” she says. It happened during a live broadcast of the London Olympics. During the women’s hammer-throw final, to be precise. Since my father had a satellite dish installed on the roof, he’s had access to more than a thousand channels. He spends whole days in front of the television—a beautiful flat-screen—and presses the button of the remote control at a consistently high tempo. Soccer games from Japan, Arctic nature documentaries, Spanish art house films, and reports on disasters in El Salvador, Tajikistan, and Fiji flash past. And then there are the programs with women, of course: gorgeous, glorious women from all over the world. Buxom Brazilian hosts; near-naked Greek showgirls; news broadcasters whose bulletins, quite aside from the language (Macedonian? Slovenian? ), are lost on him because of their full, glossy lips. Usually there will only be some five or six seconds between the channels my father alights on. But sometimes he lingers, and spends a whole evening watching coverage of the Mexican elections or a documentary series about the tropical waters off Polynesia, green as a gem. It was a Turkish sports channel that my father had stumbled across after pressing the button of the remote with his calloused thumb. The Egyptian soap that, in the space of five seconds, had homed in on just as many women’s melodramatic faces, had failed to beguile him. So Beppi pressed the button, which had once been black, then gray, and was now white, practically transparent. And that’s when he was struck by lightning. There on the screen was his princess: creamy white skin, coral-red hair, and the biceps of a butcher. She entered the circle in Olympic Stadium, grabbed the handle at the end of the chain, raised the ball over her left shoulder, and turned—one, two, three, four, five times—before hurling the iron ball with all the strength she could muster. Like a meteor having survived entry into the atmosphere, it buzzed and fizzed through the steel-blue skies of London. On impact, it left a brown hole in a meticulously cut lawn. My father dropped his remote. The lid at the back came off, and one battery rolled across the wooden floor. The Turkish commentator was full of praise for the throw, but his singsong words were lost on my father. The repeat showed his broad-shouldered ballerina a second time. Her pirouette gathered speed and ended in a brief but surprisingly elegant curtsy. He felt like he had been spinning around, too. Faster and faster. And now he was sitting here on his sofa, in love and in awe, as if he had been hit on the head by the nine-pound ball. Her name was Betty Heidler, it turned out, and she was the world record holder, having broken it by 44 inches a year ago at an international competition in Halle, Germany. It had been a warm day in May with hardly any wind, sunglasses and short sleeves everywhere. With a spring in her step the athlete proceeded to the circle with the green nets, and almost casually threw the hammer an astronomical distance. It didn’t leave a crater but bounced a couple of times, like the pebbles children throw across the water of the nearby Lake Hufeisen. In between major competitions, she worked for the police force, wearing a dark blue uniform with four stars on both epaulettes, her red hair kept in a tight bun. Polizeihauptmeisterin Heidler. In London, Betty Heidler threw a distance that was to earn her a bronze medal, but the measuring system malfunctioned, so her achievement couldn’t be determined right away. It took forty minutes before a decision was reached. These forty minutes were like a romantic film to my father. He swooned over the redheaded hammer thrower who kept appearing on-screen, sometimes close to tears. Her rival, the fleshy Chinese Zhang Wenxiu, had already embarked on a lap of honor, the red flag with the yellow stars wrapped around her broad shoulders. “No! Not the ten-ton Chinese!” my father yelled. The Turkish commentator was a bit more nuanced about it, but he too was of the opinion that Betty Heidler, not Zhang Wenxiu, deserved the bronze. Incidentally, the Chinese athlete really weighed only 249 pounds, but that was still a full 66 pounds more than the ginger hammer nymph. My epithets used to drive him mad: the long-maned girls I flirted with, the cloud-wrapped buildings my mother wasn’t fond of, the wine-purple cherry ice cream he made. And now he had used one himself for his creamy-armed hammer-thrower. The broadcast switched to an advertisement for hair spray. A bride came into view sporting a hairdo that looked like it would stay in place for at least a week. “Betty, come back!” my father shouted at the flat-screen, on which the spray was misted across the chestnut curls of the smiling bride in high definition and slow motion. His thumb moved of its own accord—the calloused old thumb, the thumb that for years had hooked itself around the metal handle of the spatolone, the large ladle with which the ice is scooped out of the cylinders of the Cattabriga. “Oh, Betty,” my father said with a sigh, echoing the many men who had once uttered the same name with yearning. Betty Garrett, Betty Hutton, Betty Grable—enchanting actresses, now almost-forgotten names. The film starring the hammer thrower resumed. She was sitting on a bench on the tartan inside the arena and staring into the middle distance, looking disconsolate. Meanwhile, the commentator nattered on. Every now and then, my father thought he recognized the names of athletes, but they may well have been Turkish words. He knew the satellite had plenty of other channels that broadcast the competition: in Danish, in German, in Italian, in Dutch. But the remote was on the floor and he didn’t want to start zapping. He didn’t want to miss a second. My father’s name is Giuseppe Battista Talamini, but my mother has called him Beppi her whole life. “I love you,” my father said. It had been twenty, thirty, maybe even forty years since my mother had heard these words from my father’s lips. My mother was silent. Betty Heidler still had tears in her eyes. At long last the chair of the jury, a woman with a wide band around her sleeve, shook Betty Heidler’s hand. Slowly, like ice cream melting, a smile stole over the athlete’s face. An embrace followed. But by the time that happened, my mother was already back in the kitchen, where a solitary pan of ground beef was simmering on the stove. Tomorrow was Saturday: pasticcio, glasses filled with light red wine, the afternoon spreading like a stain. It was an open secret that lasagna, like tiramisu, tastes better when you let it rest overnight. Shouts of joy could be heard from the television room. “Yes! She’s won—Betty’s got bronze!” my father exclaimed. “Yes! Yes!” When he started jumping up and down, happy as a child, my mother phoned me. In spring and summer she always calls me when something’s up. That’s when my brother Luca is at work. It’s an image my memory conjures up without even trying: when I hear my mother’s voice down the line, I picture Luca behind the ice cream in Rotterdam. I’m at work too, but I’m usually in a position to answer the phone. “Where are you?” my mother asks. It’s invariably the first thing she asks. There was a moment’s silence on the other end of the line. My mother, aged seventy-four, is still not used to cell phones. She has never actually held one herself. In her kitchen in Venas di Cadore, in the mountains, she never ceases to be amazed that we can communicate anywhere, anytime. Sometimes she’ll phone me when I’m at the other end of the world and I’ll answer with a sleepy voice, “I’m in Brisbane, in Australia.” I use the silence to focus on the luminescent hands of my watch on the bedside table. The fact that I’m always somewhere else is something she had to get used to long before the advent of the cell phone. I have a home, but it doesn’t feel like one. There are no plants, there’s no carton of milk in the fridge. No newspaper is delivered in the morning. It has curtains and towels, but no fruit bowl. In her short poem “Today,” the Israeli poet Nurit Zarchi writes: “Tired, I want to sit on the edge of the world, to go on strike. / But I continue onward so no one will see / the short distance between me and the homeless.” The actual distance between me and my family is short, almost insignificant, but big because of the other distance. There are days when the measuring system malfunctions. My mother is obsessed with the weather. Back in the day when she was still working at the ice-cream parlor in Rotterdam, she’d open the newspaper to the page with the weather. And she’d eavesdrop on conversations at the supermarket checkout if they were about showers and frost. Now she’s retired and many miles from the ice-cream parlor, but she still can’t help asking everybody about the weather. The weather today, tomorrow, the day after tomorrow, next week. It doesn’t matter where—it could always make its way to Rotterdam. She reckons the sky above the Netherlands is a vortex where everything gathers, but especially rain, wind, and frost. The beat of a butterfly wing in Brazil is bound to cause a hailstorm of biblical proportions above the ice-cream parlor. She doesn’t say anything, but I know she’s smiling. My mother has less of an issue with my choice for a different life. Just as she is obsessive about the weather, I love poetry, and my father loves tools. My brother is the only one still making ice cream. “Beppi’s lost his mind,” she says, and repeats what she heard him say. I laugh at the muscles my father wants to kiss. “Maybe it’s Alzheimer’s,” my mother says. “Fausto Olivo pulls his underpants over his head. The doctor says he’s suffering from dementia.” She’s referring to the old ice-cream maker from La Venezia in Leiden. He retired only a couple of years ago. His eldest son is continuing the tradition. My mother knows more about Alzheimer’s than cell phones. She’s quiet for a moment. Perhaps she’s looking at the photos on the kitchen cupboards, at the portrait of her grandson, who left for Mexico a week ago. I think about the women I’ve seen in the street here. There are lots of red-haired women in Ireland. They’re quicker to blush, because their skin is thinner and the blood shines through more easily. But often they’re even quicker to look away. Yet not so the young woman who welcomed guests at the Fermoy International Poetry Festival. As she stood behind a small desk, I noticed a pink bra underneath her blouse and a Milky Way of freckles on her skin. When I looked up again, I looked straight into her eyes, but she didn’t bat an eyelid, neither literally nor figuratively. She’d seen what I’d been gazing at. Eventually my eyes conceded defeat, and I looked down at the form on the desk. Some people become more beautiful as life wears on, as the years refine their character like a fine wine, as everything that’s been ripening—the things they’ve learned, experiences, major life events—turns into an elixir that may not prolong life, but does add a sheen to it. It’s not that my father has forgotten anything, but that all these things have ruined his character. “That’s okay,” I reply, but I can hear her walking out of the kitchen. My gaze lingers briefly on the art in my hotel room, a watercolor of a grassy plain. In the distance is a boy, walking away. In my hotel rooms I sometimes try to establish contact with the flat-screens that greet me: Dear Mr. Giovanni Talamini, it’s a pleasure to welcome you to the Ascot Hotel; Welcome G. Talamini! Enjoy your stay in the Radisson Blu; Welcome to the Crowne Plaza Hotel. Dear Mr. Talamini, it’s a privilege to have you staying at the Crowne Plaza Hotel. To continue, please press Okay. At long last, memory kicks in: I see my brother in the ice-cream parlor, a white cap on his head, in his right hand the spatola, the small, flat spoon he uses to scoop ice cream for the customers. It’s late in the evening, but still mild outside. Black birds whizz through the air, and even higher up an Airbus is making its way to America, the lights in the cabin dimmed, although you can’t see that from the ground. Young women are out on the street, some in skirts or denim shorts with the pockets hanging out. Luca’s eyes linger on their bums. His wife is sleeping, laid out like a swimmer, one arm stretched above her head, the other beside her body. The last few customers are sitting outside on the terrace: boys and girls who’ve been to the movies and now fancy a strawberry-and-mango cone, an old man who finds solace in a milk shake just before midnight. "Ernest van der Kwast tells about love between man and woman, about love between two brothers, and about the moment when both vanish. Sensuous, heartfelt, deliciously beautiful."